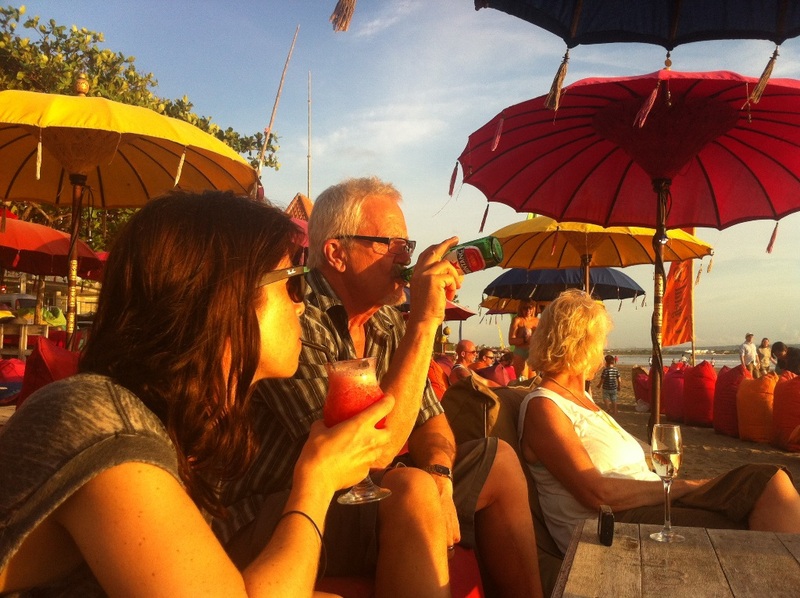 News and notes from our final week in Bali, split between two relatively upscale beaches – Seminyak: Ye of the Sunset, and Sanur: Ye of Impressive Sunrises, Should Ye Ever Manage to Get Out of Thine Bed Early Enough. Splurged for a haircut in Seminyak at a place called The Billionaire’s Cut – a surprising choice for the filthy rich, considering a haircut costs just $3.50 and includes a complimentary desultory shoulder massage for 8-10 seconds at the end. Quick, easy and cheap, although I’ll probably live to regret passing on the “Bill Gates’ Wife’s Personal Trainer” in favour of the “Warren Buffett”. Got involved in a local soccer game on the beach one day – was drafted to “Skins”, which, in my case, was probably unnecessary, considering I was the one guy in 25 that nobody was going to mistake for someone else. Because of my admirable skills, I mean. Spent several evenings watching the sunset from the comfort of some ridiculously comfortable beanbag chairs, slouched back enjoying small Bintang. Strangely, even though the large Bintangs were a considerably better deal they happened to have run out each and every day, to the curious point that someone even bothered white it out in one of the menus. We began to suspect they had run out somewhat less recently than they originally let on. Took advantage of crazy-long beach for lengthy walks on the insanely long beach, enjoying the picturesque setting sun and the smooth expanse of sand, only occasionally subjecting our bare feet to the horrors of whatever mystery liquid gives those rushing rivulets their unique, not entirely pleasant, pungency. Nothing a quick and rather immediate rinse in the ocean won’t fix, or so we hope. 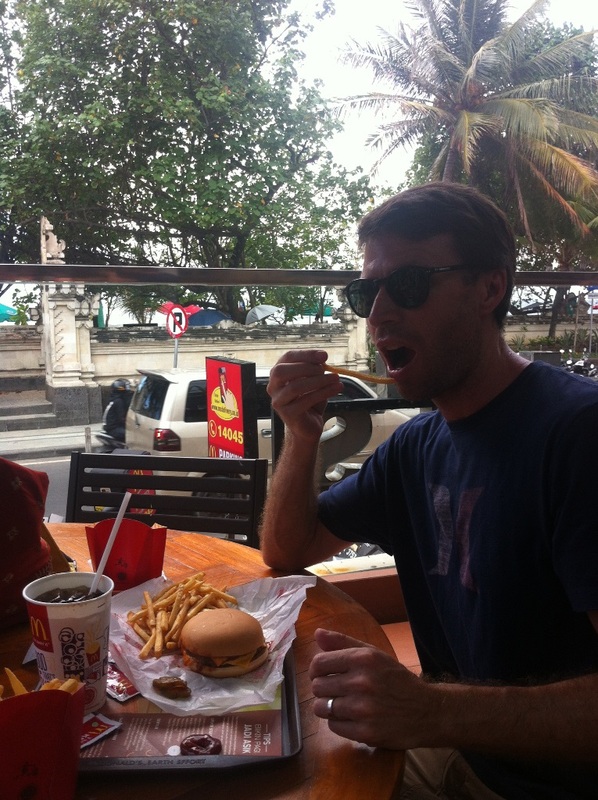 Went for McDonald’s – a meal that has become as traditional as any in our travels, since it is the only one we partake in everywhere around the world, and always start to crave after around 2 months away. Still sticking with tradition, we followed that up with a movie in a real theatre (the outstanding Whiplash), where despite the modernity of the amenities, apparently they still had to warn people against crouching on top of the Western-style toilets or, presumably worse, cannonballing right into the bowl. 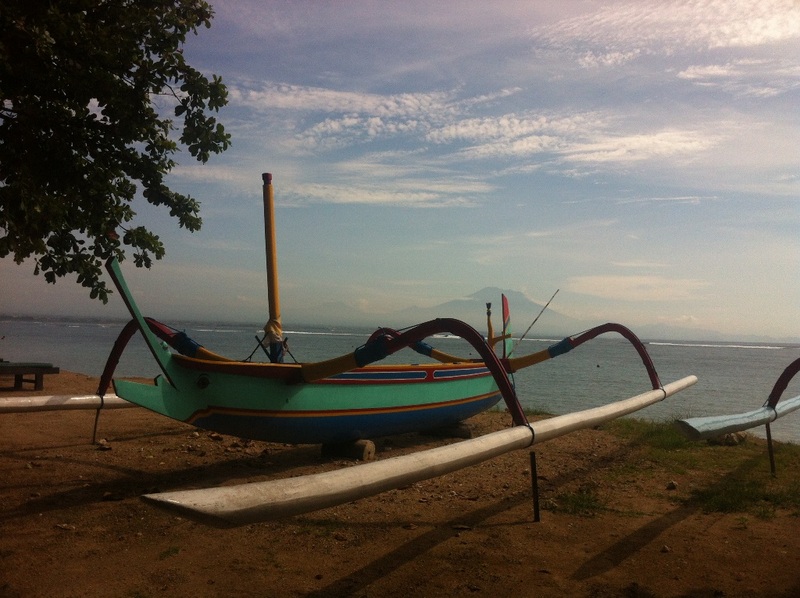 The defining feature of Sanur is its miles-long Beachwalk, a basic paved path running its entire length past soft sand, views of distant volcanoes, traditional fishing boats and occasional overweight tourists sunning themselves on struggling loungers. This extraordinary creation also led to us finally seeing people on what the Balinese refer to as “push bikes”. Essentially just a regular pedal bike, except ridden by a person who has no idea how to ride a bike. 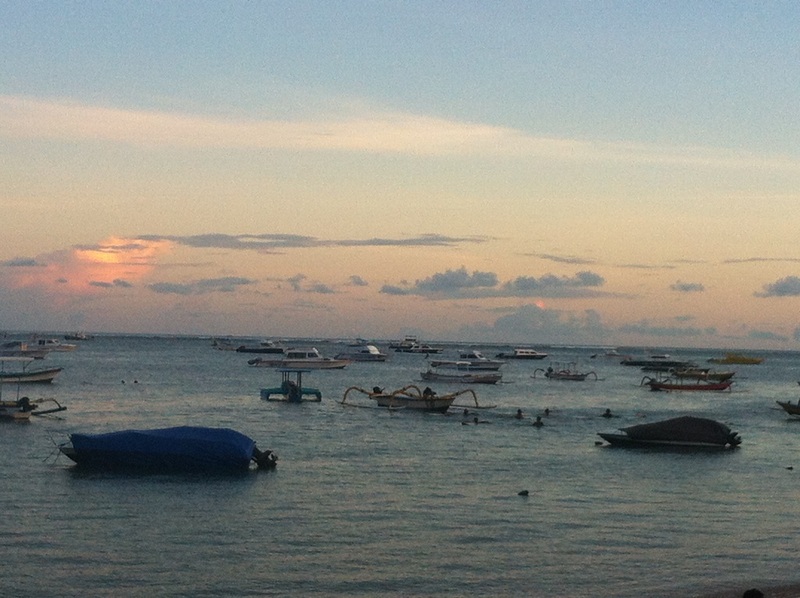 All the surf breaks around Sanur are off-shore beyond the reef. This seemingly provides two advantages – no clumsy swimmers or fully clad Asian waders to dodge, and less chance of encountering any of the floating debris so disturbingly common around Bali’s most popular beaches. The downside – you need a boat to take you out to the reef, forcing you into a clown-boat situation when the sun starts to go down and 25 of you have to pack into one tiny skiff for the ride back to the shore where you all suddenly burst free of your temporary naval captivity, wiry young surfers exploding in all directions like Balinese surfer piñata belted nice and hard with a ceremonial paddle.